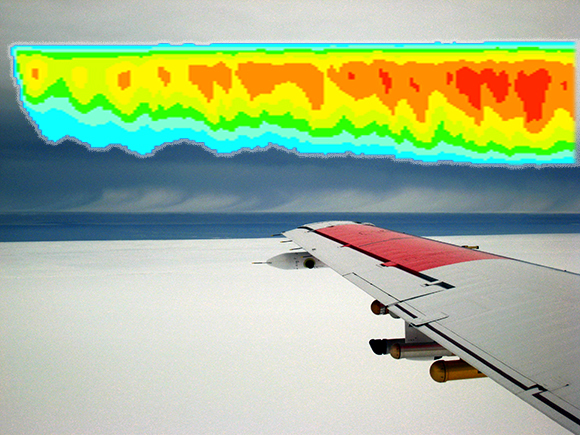 A mixed-phase cloud with precipitating ice crystals, as observed from the aircraft in April 2008 during Indirect Semi-Direct Aerosol Campaign (ISDAC) superimposed with simulated variance of vertical velocity—a measure of the intensity of cloud updrafts necessary to produce and maintain cloud droplets. Enlarge Image. Results: They are ice, they are rain—and sometimes in-between. Mixed-phase clouds, ubiquitous in the Arctic, are an enigma for scientists trying to understand their role in affecting the climate. In a study led by Dr. Mikhail Ovchinnikov at Pacific Northwest National Laboratory, scientists found that unrealistic assumptions in previous modeling studies have misled predictions about key cloud properties: the balance between droplets and ice crystals, and cloud longevity. Using 11 different models, guided by observations in the Arctic, they found that the ice number concentration property exerts a significant influence on the cloud's structure and that the ice particle size distribution influences the cloud's longevity. Understanding how important each property is in influencing cloud formation, precipitation and lifetime will improve climate modeling and projections in this sensitive area of the Earth. Why It Matters: Considered by many as climate's "canary in the coal mine," the Arctic is an area that experiences glaring indications of climate change. Despite an environment largely hostile to humans, the Arctic plays a vital role in regulating Earth's climate. The majority of clouds over the Arctic are mixed-phase clouds. They occur at below-freezing temperatures yet consist of cloud droplets and ice crystals in a super-saturated environment. To understand what makes these clouds tick, scientists are using site observations from aircraft, ground, and satellite observations to develop and improve models that mimic how clouds form and evolve. Methods: The research team limited the properties of individual ice particles, spatial resolution, and several other parameters across the models to isolate differences based on the model's physics. Because the processes that regulate the formation and evolution of mixed-phase clouds are not well understood, models have produced widely varying predictions about the clouds' properties. Many models incorrectly assumed that ice crystal size distributions are very broad and contain many large particles. 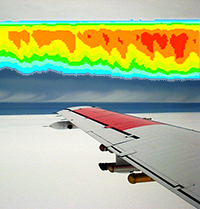 To identify sources of variability, the PNNL researchers and collaborators from the National Aeronautics and Space Administration, the Massachusetts Institute of Technology, and 10 other institutions performed simulations of mixed-phase Arctic clouds by 11 different models using computing resources at the Environmental Molecular Sciences Laboratory (EMSL), a DOE national scientific user facility. The findings underscore the need for a better understanding of the distributions of ice particle sizes that occur in nature. The important role of ice particle size distribution in determining cloud evolution suggests that adjustments of this parameter in climate models will reduce variability and improve accuracy. What's Next? The study demonstrates that the realism of simulated mixed-phase clouds can be greatly improved by using the correct ice crystal size distribution. Several studies are underway to develop a more general method to predict or diagnose a measure of the width of the ice spectrum using a combination of in situ and remote sensing observations and modeling. Sponsors: This work was supported by the U.S. Department of Energy's Office of Science, Office of Biological and Environmental Research, Atmospheric System Research program. Research Team: Mikhail Ovchinnikov, Jiwen Fan and Steven Ghan, PNNL; Andrew S. Ackerman and Ann M. Fridlind, NASA Goddard Institute for Space Studies; Alexander Avramov, Massachusetts Institute of Technology; Anning Cheng, NASA Langley Research Center; Jerry Harrington, Pennsylvania State University; Corinna Hoose and Marco Paukert, Karlsruhe Institute of Technology, Germany; Alexei Korolev, Environment Canada, Toronto; Greg M. McFarquhar, University of Illinois at Urbana-Champaign; Hugh Morrison, National Center for Atmospheric Research; Julien Savre, Stockholm University, Sweden; Ben J. Shipway, Met Office, Exeter, UK; Matthew D. Shupe and Amy Solomon, University of Colorado/NOAA; and Kara Sulia, Princeton University. Reference: Ovchinnikov M, AS Ackerman, A Avramov, A Cheng, J Fan, AM Fridland, S Ghan, J Harrington, C Hoose, A Korolev, GM McFarquhar, H Morrison, M Paukert, J Savre, BJ Shipway, MD Shupe, A Solomon, and K Sulia. 2014. "Intercomparison of Large-Eddy Simulations of Arctic Mixed-Phase Clouds: Importance of Ice Size Distribution Assumptions." Journal of Advances in Modeling Earth Systems 6(1). DOI:10.1002/2013MS000282. See also: "Ice particle size matters"